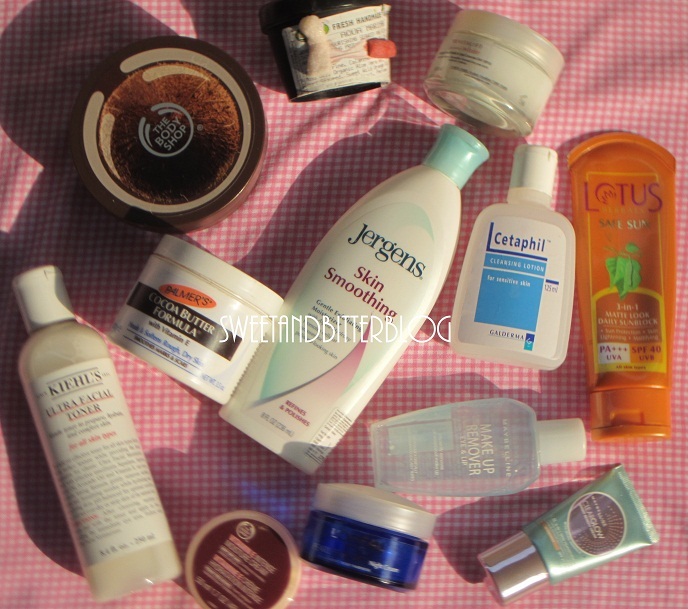 I was thinking of doing this for long but then my skincare routine was super simple. But after I moved in to Kolkata, a lot changed – diet, humidity and lifestyle. 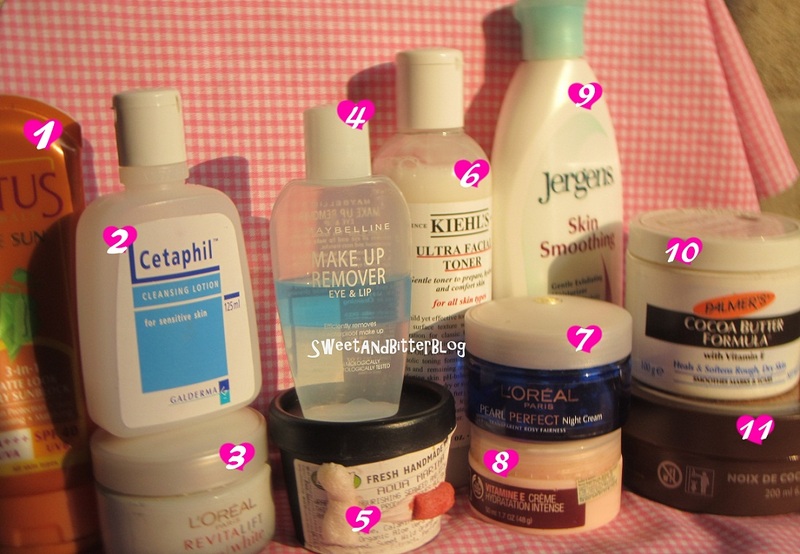 So, here after a lot of hit and trial, I ended up with this skincare routine. To be true at present, less is more much more. It’s very sensitive now and I cannot use anything harsh on it – no face wash to be specific (other than Kiehl's Ultra Facial Cleanser and I only have few sample left as Kiehl's is not in Kolkata). 1. Lotus Safe Sun 40 SPF - I usually don’t have much time after I get up and run for office. I also do my makeup in office. So, I clean my face with water. (How I wish I have a bottle of Kiehls Cleanser) and I use Lotus Sunscreen. I generally use the SPF 50 one which is lighter than this one and this 40 SPF one lives in my everyday bag. 2. Cetaphil Cleansing Lotion for Sensitive Skin – I wash off all the dirt and the sunscreen right after I reach office (don’t want to sit all day with the pollutants on my face huh?). I love it and I am using it for 2 years now. I got a severe case of ance after my first ever (and only) facial experience. Boy was out of town and we were supposed to go to somewhere for Christmas. I freaked out and went to doc who gave to loads of medicine(which I checked later and found were strong steroids – I guess I freaked him out about my upcoming, much awaited vacation ) and this is something that I continued to use. Not always in fact. I do not keep a stock of this or buy back to back but I always try to have it with me. 3. L’Oreal Revitalift White Day Cream – A very sweet SA gave me a sample of this. I was not sure about using a anti-aging cream but I wanted to included something in my daily routine. Plus it talks about fairness so, I was against it. I am very happy that she forced me to try the sample because I love this. I got the full size two months back. Let me know you want a detailed review. 5. Lush Aqua Marina - I talked and bored you about this already HERE. 7. L’Oreal Pearl Perfect Night Cream – Another fairness product? No I do not want to be fair but I love this. I have used the Day Cream and it actually made my skin more bouncy(weird?). After I got L’Oreal Revitalift White Day Cream, I thought of getting the night for this. I might switch between the day and night again. I am sure it would not work as a sole moisturizer where its too cold (read Delhi) but its working like magic in here. 8. The Body Shop Vitamin E Hydration Intense Creme – Another of my all time favorite but I do not use it much now because its INTENSE and I do not need anything INTENSE. It is mostly use for specific spots where I feel extra care should be given. 9. Jergens Skin Smoothing Gentle Exfoliating Moisturizer – I mostly use it only on my hands (but not elbows.) I got this just 2 weeks back and I am amazed with the fast absorbing quality. LOVE. But surely won’t repurchase as I am sure it won’t work when it gets colder and dryer in here. BTW I have no idea why its called a gentle 'exfoliating' moisturizer. Seriously......why? 10. Palmer’s Cocoa Butter Formula with Vitamin E – Love has a name and this is it. This is the first product that I reviewed so you can guess my love for this one.